Before Schliemann began his archaeological investigations at Hissarlik in 1870, many scholars believed that Troy was a mere figment of Homer’s imagination. The story of the Trojan War, as it was described in the Iliad and the Odyssey, lacked corroboration from reliable historical sources, and the ancient city’s geographical position had never been determined. Excavating entirely at his own expense, Schliemann discovered multiple cities built one above the other after periodic destruction by earthquake, fire, or war. The golden treasure he found there dazzled the world and led to an understanding of the historical period now known as the Bronze Age. The present volume is Schliemann’s own account of his discoveries at Troy, including a brief but fascinating autobiographical sketch. He also replies to critics of his decision to deceive the Turkish authorities, smuggling his discoveries to safety in the west. He defends his actions on the grounds that these objects belong in museums, not in the black market of international antiquities—their probable fate had they remained in Turkey. 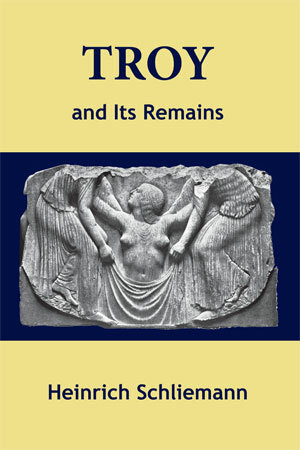 Troy and Its Remains contains over 500 illustrations. This illustration from Troy and Its Remains by Heinrich Schliemann shows his wife, Sophie, wearing a golden diadem found on the site of Troy. In his enthusiasm, Schliemann believed this to be part of the treasure that had once belonged to King Priam. Later research suggests that this object was found in a strata much older than that which bears artifacts from the time of the Trojan War. Another illustration from Troy and Its Remains by Heinrich Schliemann shows the god Apollo astride four horses as depicted on a stone stela. Binding: softbound; page count: 496; illustrations: over 500; trim size: 6" x 9"; ISBN: 978-0-9824034-6-4; Publisher: Symbolon Press. This book is a facsimile edition of the 1875 original. The quality of the text and over 450 illustrations is very good to excelent. A spindle whorl from Troy, one of the many found by Schliemann and illustrated in Troy and Its Remains. This artifact shows a god or goddess with upstretched arms and four semi-circular objects believed by Schliemann to represent rising suns. More recent investigations suggest that these four mysterious symbols represent four land masses separated by the four rivers said to flow from one source in paradise. At the center of this paradise stood, according to many religions, an enormous Tree of Life located at the axis mundi, the center point of stellar rotation. Thus the rotating spindle whorl represents, in miniature, the whirling cosmos. For more about the World Tree or Tree of Life, click here. Examples of many other symbols found on spindle whorls at Troy can be found here..